“It’s is a very disappointing judgement, because the Supreme Court has actually said it is people’s fundamental right to come set up a commission against anyone that they accuse. 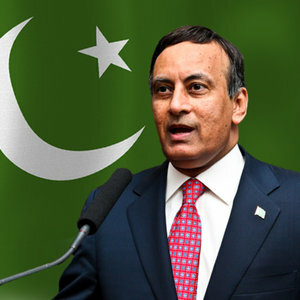 So once a commission is set up and if Mr Haqqani is aggrieved by that something the Commission has done, there’s nowhere he can go; his due process has been taken away. But more than that it has restricted fundamental rights to national security. It’s a big blow to those who believe in the democratic process and in the protection of fundamental rights”. Asked what the course of action should have been, she pointed out that there was already a parliamentary commission looking into ‘Memogate’. And secondly “there are laws in this country under which they could have got an investigation”. Instead, they moved to the highest court as the first instance, taking Mr Haqqani “out of the queue and denying due process”. In her Dawn News interview later, elaborating, she says she expected the judges to uphold the Constitution and fundamental rights, rather than undermining them in the guise of ‘national security’. “I don’t have great expectations from the judges, they seem to have expectations of themselves,” she said. “I’ve argued in court, because this is such a politicised matter, let the politicians settle it. Secondly, if we want to further democratic norms and traditions, we need to support the power of the people” rather than the power of the establishment. It is this that will provide the state its true security. Asked what proof there was that the petition was sponsored by the military, she said for one thing, they are never in such a hurry to reply, secondly, they didn’t go through Attorney General, and thirdly, it’s “clear that the federation is giving one answer, they’re giving another”. Could this have happened if the government wasn’t weak, asks Jan.
She said she had asked Husain Haqqani to get another lawyer for the Commission, as it was too much for her blood pressure. “As a professional lawyer, shouldn’t you be able to fight this case also?” asks Jan. The basic issue, she stressed, is the civil-military relationship. The judgement has been a setback to the struggle for democracy and due process. The struggle, as Asma Jahangir said, will continue. The struggle, as Asma Jahangir said, will continue. Three cheers for Asma Jahangir. But what about the Mullah who has turned our constitution into a ‘Fatwa’, which even the military could not touch.